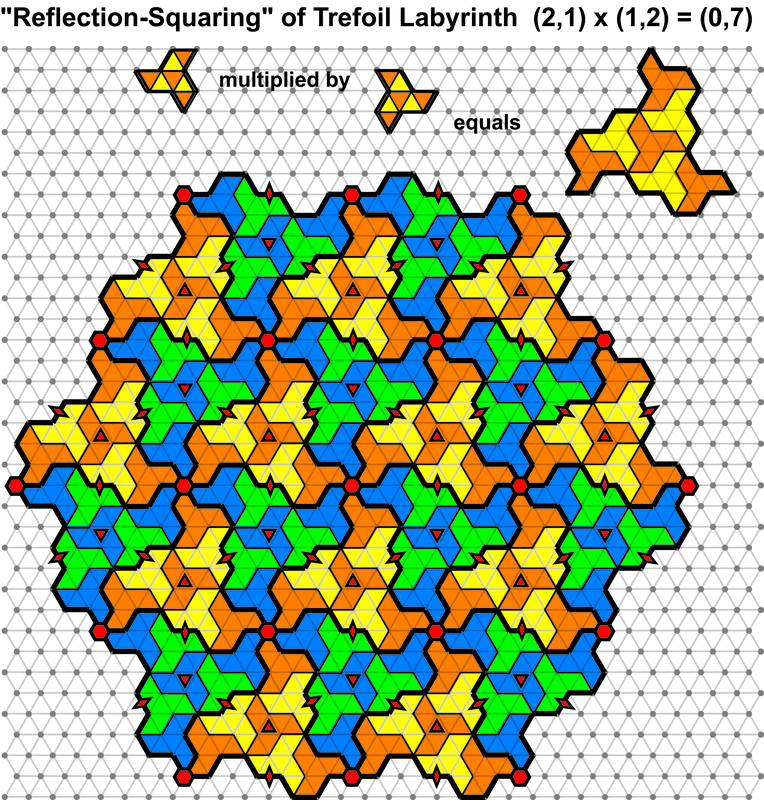 Revision: In the previous post we investigated “squaring” a lattice labyrinth tessellation, multiplying the tessellation by itself and by its mirror image. This is equivalent to multiplying number pairs (a,b) x (a,b) and (a,b) x (b,a) where (a,b) are the separation parameters of the tessellation. For values a ≠ b ≠ 0 we find we that the three non-zero parameters of the resulting product tessellations constitute a Pythagorean triple, the sides of a right-angled triangle such as 3,4,5. 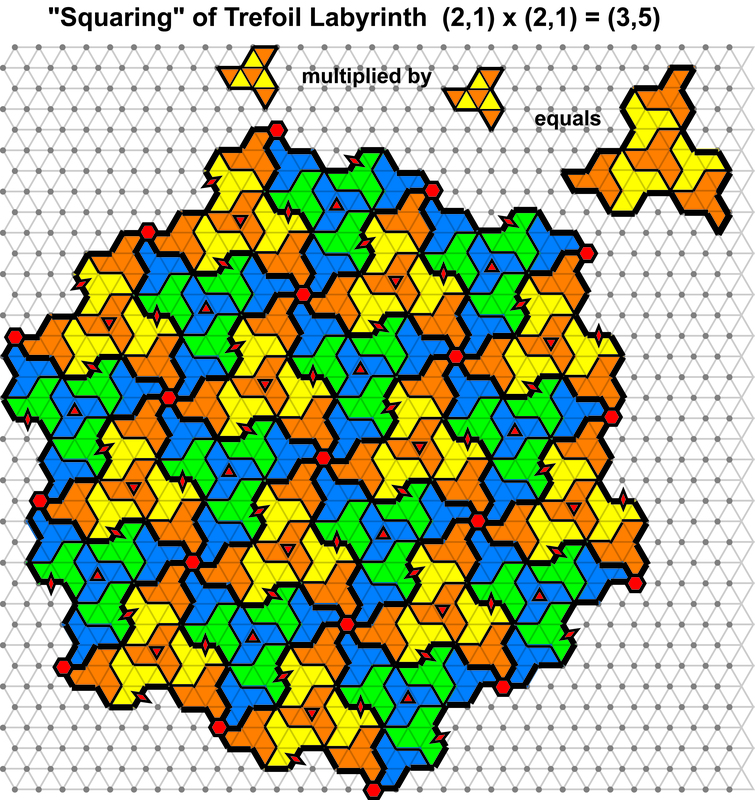 More generally, it is also the case that if,we multiply one tessellation by a different one, (a,b) by (c,d) we obtain a product tessellation with separation parameters (m,n), say , where m² + n² = (a² + b²) x (c² + d²) so that the supertile area of (m,n) is the product of the supertile areas of (a,b) and (c,d). This is what makes constructing a “tessellation of tessellations” possible. The purpose of this post is to do multiplications for lattice labyrinths on the TRIANGULAR lattice analogous to those summarised above for the square lattice. 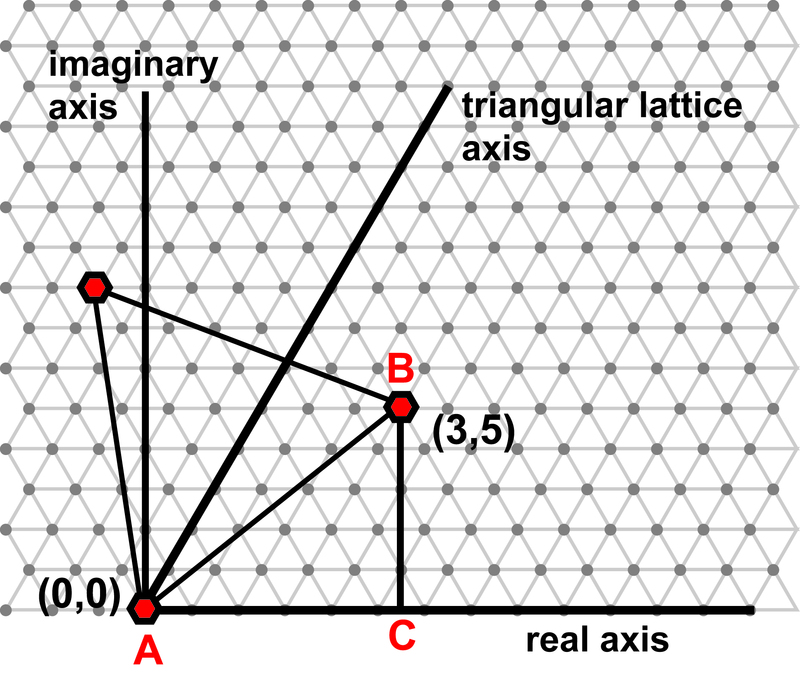 On the triangular lattice a lattice labyrinth tessellation is specified by separation parameters (e,f) measured along axes at 60° to each other. Below I illustrate the “squaring” of Trefoil Lattice Labyrinth (2,1), multiplying it by itself and by its mirror image, equivalent to multiplying the number pairs (2,1) x (2,1) and (2,1) x (1,2). I’ve shown all the symmetry axes in the results – lozenges for dyads, triangles for triads and hexagons for hexads ( if baffled see earlier post on rotational symmetry simply explained). Looking at the non-zero separation parameters of these two product tessellations we find that we’ve generated another triple of numbers: 3,5,7 which is certainly not a Pythagorean triple. To understand the significance of these numbers we need to look at the areas of a supertile, expressed as the total number of little triangles of the lattice it contains. We can calculate this algebraically, but let’s demonstrate the result geometrically instead. Equilateral triangle/ supertile area = 3² + 5² + 2 x 2 x (3 x 5) – 3 x (3 x 5) = 3² + 5² + 3×5. We can do a similar construction and calculation for any pair of separation parameters, not only for such a tessellation-of-tessellations but also for any triangle set out at separation parameters (e,f). Area of supertile of (e,f) = e² + f² + ef or, as I prefer to order the terms e² + ef + f². Compare this with the area of a square specified by (a,b) on the square lattice, which is equal simply to a² + b². Number of the form e² + ef + f² are known as Loeschian (or Löschischen?) numbers. You can demonstrate either algebraically or geometrically that Loeschian numbers are always of the form 3x or 3x+1, never 3x-1. In general, if (e,f) x (g,h) = (m,n) then (m² +mn + n²) = (e² +ef + f²) x (g² +gh+ h²) and so we can have tessellations of tessellations on the triangular as well as on the square lattice. BUTBUTBUTBUT! 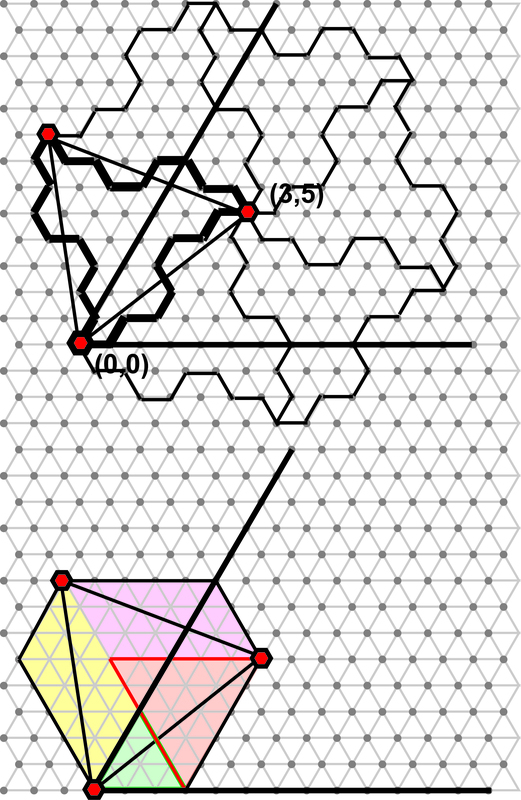 How DO we multiply the separation parameters of tessellations on the triangular lattice? WHY does (3,5) = (2,1)x(2,1)? WHY does (o,7) = (2,1)x(1,2)? How, in general, do we arrive at (m,n) as the product of (e,f) and (g,h) on the triangular lattice? We must follow the same procedure with number pairs set out on the triangular lattice as we did in the previous post with number pairs on the square lattice, we need to convert number pairs on the triangular lattice to a single complex number. This is slightly more complicated as complex numbers are defined relative to the real and imaginary axes at RIGHT ANGLES to each other, not axes at 60° to each other. See below. You can see that length AC = 3 + 5/2 and that BC = 5√3/2, so the number pair (3,5) can be represented by the point on the complex plane ( 3 + 5/2) + (5√3/2)i .
which you can see “contains” the multiplication rule on the square lattice but with one extra term fh added. This is such a simple result; surely there must be a shorter and more elegant derivation. It works! 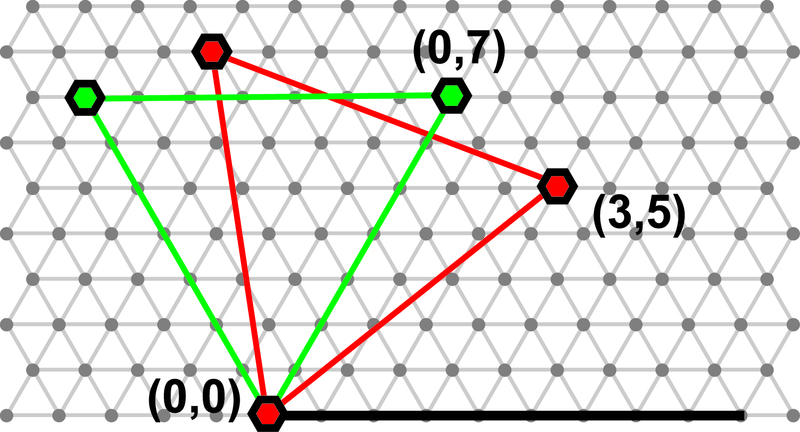 On the lattice we can see that the green and red triangles specified by separation parameters (3,5) and (0,7) do indeed have the same side length and area (49 triangles). With our number pair multiplication formula we can now generate lots of triples on the triangular lattice in the same way as we can generated lots of Pythagorean triples on the square lattice, by “squaring” number pairs (e,f) where e ≠ f ≠ 0. (It’s worth checking what happens if e = f or f = 0). 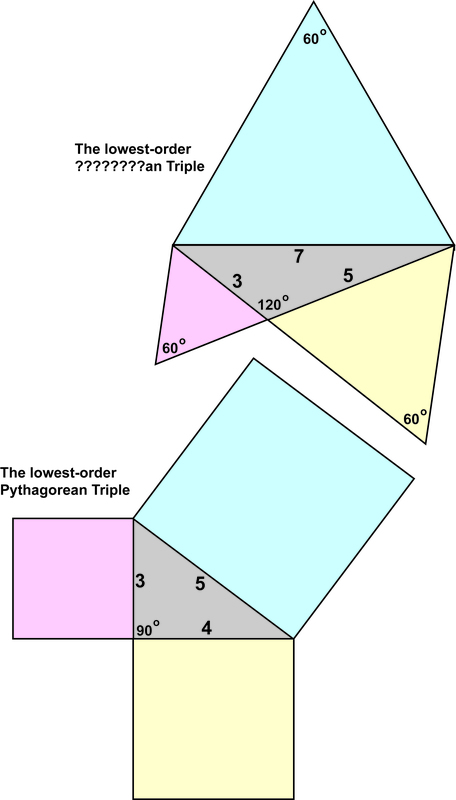 We can also see how the triple 3,5,7 is the geometrical analogy in the equilateral world of the theorem of Pythagoras in the square world. Each triple specifies a triangle with two sides at 120º to each other and of whole-number lengths and a “hypotenuse” side which also has a whole number length. The areas of the two smaller equilateral triangles PLUS the area of the grey 120º triangle itself add up to the area of the largest “hypotenuse” equilateral triangle,a curious advance on Pythagoras’ theorem for the squares on the sides of a right-angled triangle. So our innominate triples are : ( e² – f²), (f² +2ef), (e² + ef + f²) I don’t know what these triples are called. Someone please enlighten me. Maybe they don’t have a name. These expressions can be found in an extensive Wikipedia article on triangles with integer sides, but no name is associated with them. To achieve compatibility with the way Pyathagorean triples are expressed, here are the innominate triples on the triangular lattice in terms of the conventional a and b: ( a² – b²), (b² +2ab), (a² + ab+ b²). Let’s (unofficially) nominate the innominate a TRYTHAGOREAN TRIPLE. The last member of each triple is a Loeschian number where a ≠ b ≠ 0. Here are the lowest order trythagorean triples with the number pairs that generate them. (6,2) 28,32,52; (7,1) 15,48,57: (5,4) 9,56,61; (6,3) 27,45,63. Some of the above triples are not primitive, for instance 12,20,28 is just 4 x 3,5,7. The above list misses out two further non-primitive triples: 6,10,14 and 14,16,26. These triples require multiplying DIFFERENT factors of 14² and 26² as 14 and 26 are not Loeschian numbers (being of form 3n+2) and cannot correspond to a number pair (e,f) on the triangular lattice. To generate 6,10,14 we need to multiply (5,3) and (7,0) by (2,0); to generate 14,16,26 we need to multiply (8,7) and (13,0) by (2,0). Phew! Maybe I’ll do a purely pretty post next time. Here are some links to the inexpensive how-to-do-it Lattice Labyrinths workbook which is available from the publisher or you-know-who , or from a good independent bookshop or via Google. After terminating academic and local government careers, long an independent bookseller/publisher at Scarthin Books, Cromford, Derbyshire, UK. An antiquarian bookseller in two senses, I now have more time to be an annuated independent post-doc, developing the long dormant topic of lattice labyrinth tessellations - both a mathematical recreation and a source of compelling practical tiling and textile designs. Presenting a paper and experiencing so many others at Bridges Seoul 2014 Mathart conference was a great treat, as were the spirited MathsJam Annual Conferences in November 2016 and 2017. I'm building up to a more academic journal paper and trying hard to find practical outlets in graphic design and landscape architecture. I submitted 8 ft square tiling designs to the Wirksworth Festival Art and Architecture Trail in 2016 and 2017. I love giving illustrated talks, tailored to the audience. Get in touch to commission or to collaborate. This entry was posted in Mathematics, Trefoil Labyrinths and tagged Eisenstein Integer, gaussian integer, innominate, Irrgarten, labyrinth, Lattice, Loeschian, MathsJam, pythagorean triple, Rachel Hall, Trythagorean. Bookmark the permalink. That’s very nice. I have no ideas about this subject before (despite the numerous recreational math books that I have read). So, thanks for sharing it with us. (x² + y²) = (2xy) + (x² – y²), where x and y can be any positive integers. This is latticelabyrinths at the PhD level, right? I understand some of it, but much of it is over my head. I’m sure the more I read about it, the more I’ll eventually understand.